Edited by: Hans-Jürgen Sasse †. 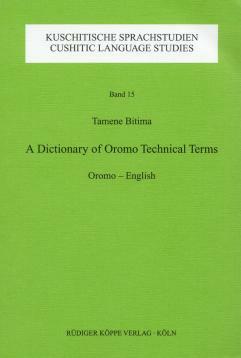 This series used to be a forum for studies of any kind which may enrich our knowledge in the field of Cushitic languages and dialects. Both data-oriented and theory-oriented contributions were welcome: dictionaries, grammatical descriptions, text collections, historical and comparative studies, as well as theoretical works on specific aspects of language structure such as phonology or syntax. From volume 26 onwards, this series will be continued by us under the extended title Cushitic and Omotic Studies, starting with volume 1, edited by Hans-Jürgen Sasse † (University of Cologne, Germany) and Mauro Tosco (University of Turin, Italy). Author: Roland Kießling, Maarten Mous. Author: Maarten Mous, Martha Qorro, Roland Kießling. Author: Steve Pillinger, Letiwa Galboran.